Someone once said to me that I would write a thank you note to someone if they held the door for me. I laughed, and secretly took it as a compliment, not because I think over using thank yous is a good thing, but because I've made it a point to use snail mail + email (more snail mail) as a way of making sure people know what they mean to me--whether they're my best friend in the world, or someone I met once who was extraordinarily kind or witty or patient. The note above is one that was written to me quite a few years ago. It's maybe the most important note I have in my possession--one of those things you list when someone asks what you would carry out of a fire. It always sits on my bureau, or tucked in a mirror, and Im always afraid of it fading or getting dirty or lost. In fact I'm always meaning to frame it, but that hasn't happened yet. 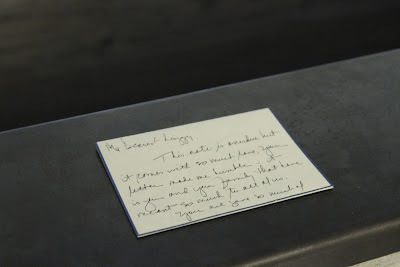 This notes impetus was a note I wrote to the author, explaining what she meant to me. And every since I've known the value of telling people when they better my life in any way. Somehow (maybe through Linda and Harriet?) I ended up on your blog the other night. I was on a 30 hour shift at the hospital. It was quiet, but not quite quiet enough to sleep (to be honest, those call room beds aren't so comfy anyway) and I ended up reading through most of your posts. They are so wonderful. I had heard the Oriah Mountain Dreamer poem awhile back, but forgotten it. The part "I want to know if you can get up/ after a night of grief and despair/ weary and bruised to the bone/ and do what needs to be done/ to feed the children" certainly touched me at 4am in the NICU, but even after some sleep - really beautiful. And there wasn't a recipe I saw that I didn't want to try. I've had this feeling recently that it's important to let people know, and to thank them, when the things they do make my life better. Clearly this friend + I are on the same page in this department. And if she knew how much this note meant to me, she would know why she's had that feeling lately. I hope you're telling people in your life what they mean to you when you feel it. Thank you M.
This is really nice, and I agree about the power of the handwritten note. It's so easy to get stuck in the cycle of complaining (especially at work), but things like this blog and letter make me stop and think about all the things I'm grateful for.